Welcome to our Creative Harbor where we are usually (when holiday pause is not happening) creating brush painting, haiku and photography. Although 'pausing' is a simple way to slow down and tune into the fleeting moment, to appreciate what is right in front of oneself. It is the ability to respond to the 'now'. Whether creating photos, sketches or poetry or any creative expression, it provides me with the moments to 'attend to' the present. It helps me to slow down and breathe more deeply and listen to my soul and what it is telling me. Hope you have had time to 'pause' and enjoy creating and sharing with family and friends and will continue to do so through the end of the year and the New Year to come. the circle of rocks fosters the image of buffaloes resting. I'm curious about its being a sacred spot. So, it's in your back yard? nice! 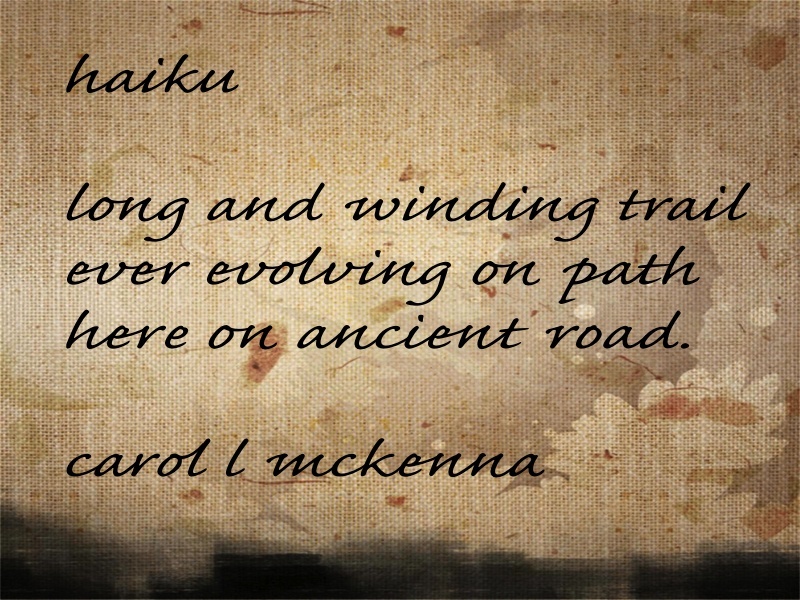 beautiful Haiku and a beautiful reflection circle,thats amazing! I like the ever evolving aspect of the road! Nice. Also, I love how you frame your poems and print in various fonts etc,, Very curious how you are creating such a wonderfully creative variety of images!! So artistic. 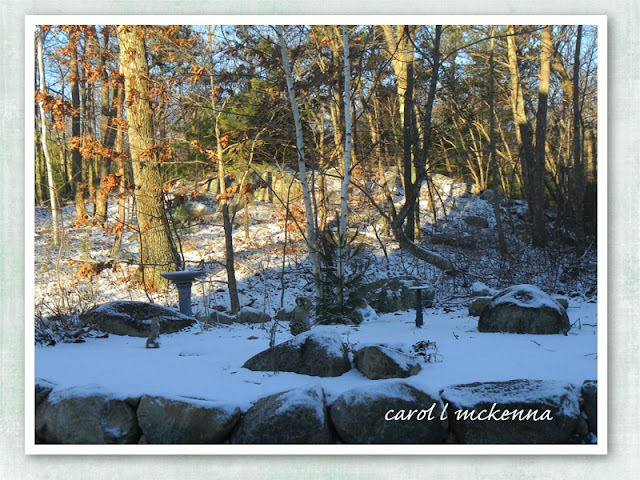 I love that snowy reflection circle in the garden. Beautiful. Beautiful sacred circle, Carol. We also have some deer here in our mountains, magical, yes. 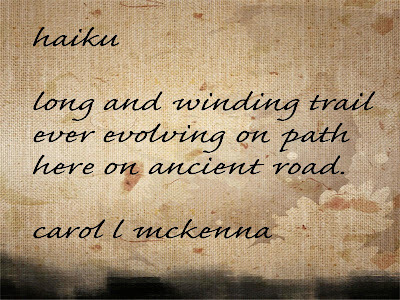 The Beatles' "long and winding road" came to my mind reading your haiku; trail... path...road, very evocative. love the idea of a sacred reflection circle. You live in a beautiful place and on a nature park too. Thanks for sharing such a lovely place. Wonderful captures Carol ... and now I must Google Haiku to see what it means ... I never hear the word used down here. I really felt great reading your post. 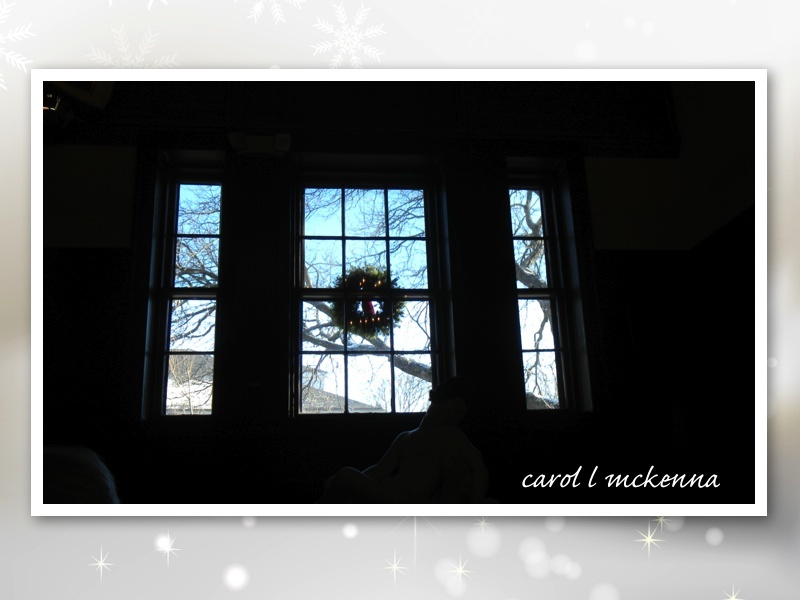 Thank you, Carol and all the very best for the coming year! 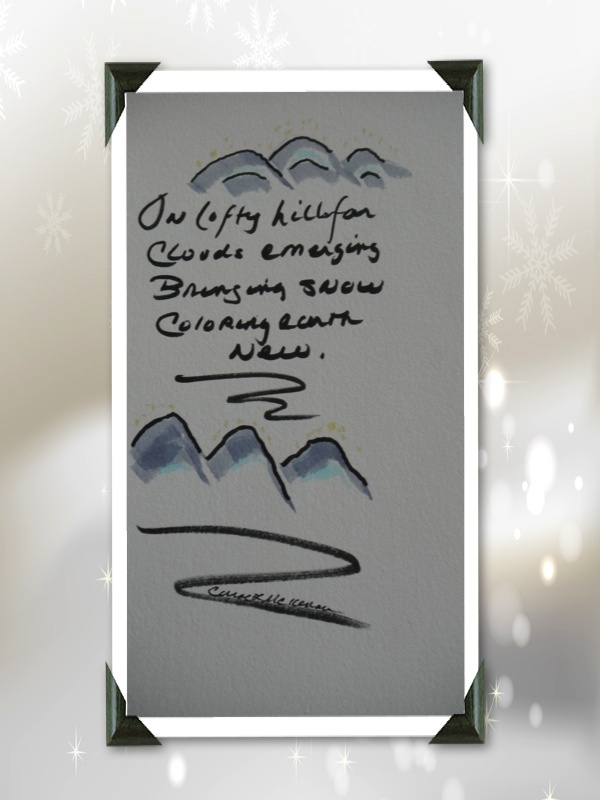 I love your haikus- Happy New Year to you and yours! Lovely circle of rocks...brings back memories of our good ole camping days. Beautiful photos. Love your garden. Hi. Beautiful reflection circle photo! Your Haiku is very cool. I like the idea of "pausing". Yes, I think I'd like to pause with that cute little pup. What a cutie. Love your winter photos. Best wishes for a joyous, peace-filled and creative New Year! the window is so lovely!! Fabulous photos! Happy New Year! Such wonderful winter scenes and images!! Wishing you and yours all the best in the up and coming new year! That wreath framed by the sash windows is beautiful... Thank you for sharing on Weekly Top Shot #63! That quote is wonderful! Love the photo of the Sacred Circle. Lovely work!